Anxiety is a word that seems to be used more commonly today than in years past. By definition, it is the overall feeling of excessive unease, nervousness or worry that a person experiences even though there is not a real threat lurking just around a dark corner. It would seem to those who have not experienced overwhelming anxiety that sufferers should simply be more firm with their own imaginations or emotions and calm down. Sadly, it is just not that simple. Such disorders are hard to control and quite frequently interfere with everyday life. Anxiety disorders can begin in childhood, in the teen years, as a young adult or even in adulthood. In fact, the World Health Organization estimates that almost 4 percent of the world’s population suffers from anxiety disorders. There is no research that has pinned down any specific anxiety causes for these disorders. However, researchers believe genetics, traumatic events, changes in brain structure and other environmental factors such as work and family life may be contributing factors. Anxiety may even be caused by other disorders such as PTSD and OCD. These professionals can not only help determine which type of anxiety disorder you are suffering with, they can also help find ways to make the symptoms less severe. There are several different types of anxiety disorders and working with a mental health professional can help determine which type you might be suffering from. Once this diagnosis is made, a doctor or therapist will be better able to recommend the right type of prescription medication, therapy and/or lifestyle changes that will help combat the anxiety symptoms. People who suffer from phobias generally have overwhelming fear about something, and this fear makes them unable to go about their daily lives as most people do. Some are afraid of bugs and spiders while others are afraid of tight spaces or of heights. There is help for coping with phobias both in the form of cognitive therapy and medication. Over 6 million adults in the United States suffer from generalized anxiety disorder (GAD), but less than half are getting any type of helpful treatment for these symptoms. Unfortunately, women are two times as likely to suffer from GAD symptoms. This disorder causes people to be extremely uncomfortable or nervous much of the time. Social anxiety is much like general anxiety but is typically only experienced in social settings. People who experience social anxiety often find that it is difficult to go to school, to work or to any type of social situation. There is help available for both general and social anxiety sufferers, and the first step is to make an appointment with an anxiety doctor in San Francisco. Those who have ever experienced a traumatic situation could be experiencing signs of post-traumatic stress disorder (PTSD) without even realizing it is happening. This disorder frequently presents with nightmares, flashbacks and an overwhelming need to avoid specific situations or events. The trauma and resulting conditions frequently lead to anxiety attacks, substance abuse, and compulsive behavior. A doctor can not only prescribe helpful medications, but they can also suggest effective group programs and alternative therapies that have been proven to help PTSD sufferers. 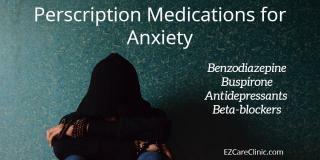 Benzodiazepine – Most commonly prescribed for those with short-term anxiety, panic disorder, and generalized anxiety disorder, this type of prescription anxiety medication works to increase the communication of the chemicals that help bring messages to a patient’s brain. Overall, these sedatives help relax muscles and calm the mind. Buspirone – Though the reason this type of medication works is somewhat of a mystery, buspirone is frequently prescribed to treat short-term and longer-term anxiety. Antidepressants – Used in the treatment of anxiety, depression, obsessive-compulsive disorder and dysthymia, this category of medications is one of the most highly used and must be prescribed by a doctor or psychiatrist. SSRI’s – Selective serotonin reuptake inhibitors trigger the brain to have a higher level of the neurotransmitter, serotonin which can affect the ability to sleep, remember details, and even have an appetite. Tricyclics – This older group of drugs is not prescribed as frequently today as it once was due to frequent side effects such as dizziness, dry mouth and lack of energy to name a few. They work by helping to increase how much serotonin is available in the brain. MAOI’s – Typically used in the treatment of panic disorder and social phobias, this type of prescription helps to boost the number of a mood-regulating neurotransmitter in the brain. Beta-blockers – Though these are used most commonly to treat patients who have heart conditions, they have also been found to help some of the physical symptoms of anxiety and are especially effective for treating social anxiety disorder. The best news for those suffering from anxiety is that there is help available, no matter what the anxiety causes are. Medical professionals in the San Francisco area can help direct individuals to counselors, therapies and medications which have proven to be beneficial. Some can also recommend more holistic therapies such as meditation, Tai Chi, diet recommendations and overall stress management. In this day and age, there is simply no need for anxiety to rule your life. EZCare Clinic in San Francisco offers regular appointments and walk-in care to make the process one step simpler. Call our office or schedule an appointment online. Whether you are looking for a first diagnosis or a prescription refill for anxiety meds, our medical professionals are here to help.